Our home state Kerala in India which the tourism department very glibly calls ‘God’s own Country’, has always had an enduring love affair with elephants. Children romanticise the elephant with several fairy tales, nursery rhymes and moral lessons with an elephant as the main protagonist. 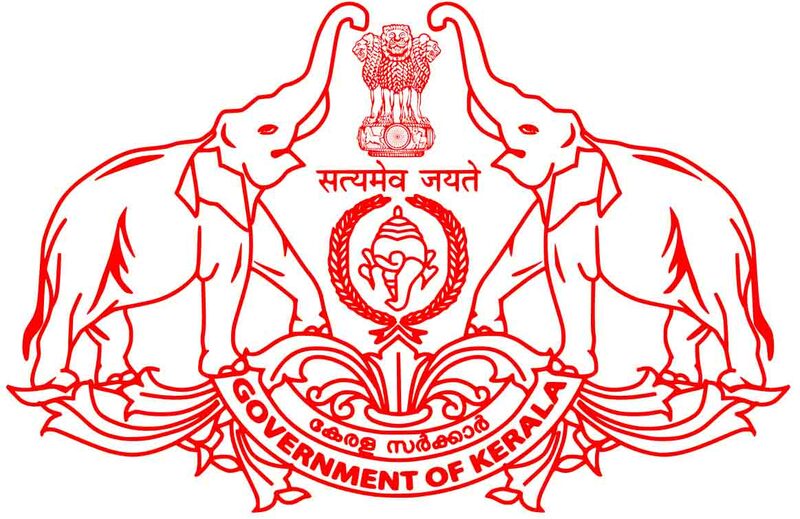 The Indian elephant (Elephas Maximus Indicus) has been declared as the State Animal and the state emblem symbolises two elephants guarding the state insignia – the Shankh (conch shell) of Lord Padmanabha – and the national insignia – the famous Lion Capital. It is estimated that Kerala has more than five hundred domesticated elephants. They are used for religious ceremonies in and around the temples, and some churches and mosques also, and a few elephants work at timber yards. For all the festivities in Kerala, Tuskers are in demand, obviously for their getup. They are attired in all finery and caparisoned. 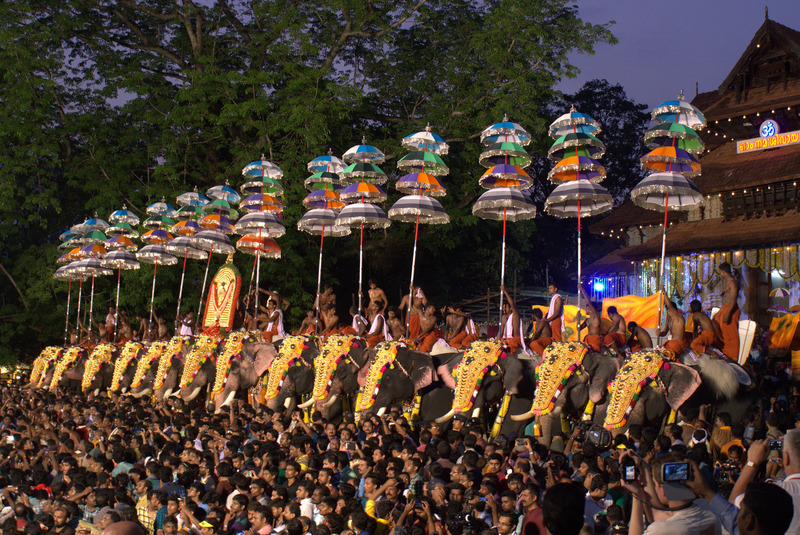 Nearly a hundred elephants are paraded during Thrissur Pooram (during the month of May), the largest annual temple festival in the state. Despite protests from several animal rights organisations and quite a few incidents resulting in human fatalities /serious injury, the love affair seems to continue. Elephantine dentistry is of some interest. Elephants have a total of 26 teeth, their tusks counting for two. Unlike humans, elephants may erupt only two or three sets of molars at birth. When teeth that have erupted get worn out, another set will erupt behind the existing set. So perhaps it is impossible to find an elephant with all 26 teeth as they come out sequentially, Each time they lose these teeth, the new ones that grow are larger, allowing them to chew even tougher vegetation like tree bark, palm leaves, roots, etc. A single molar in an adult elephant may weigh as much as a humungous 5 kg. Like most mammals, elephants have teeth called incisors, which eventually become tusks as they grow into full-grown adults. Male Asian elephants have long tusks (hence called Tuskers), but for the females, the incisors barely protrude out. In the African species both males and females develop tusks. As the tusks are made of ivory, wild Asian male elephants become a target for merciless poaching. The tusks are used as an offensive and defensive weapon in both intra-species and inter-species fights, for lifting weighs and for stripping bark of trees to be used as food. Elephants are also known to dig for water in dry river beds using their tusks, trunk and feet. Besides all this the tusks also serve to protect the sensitive trunk which is a multi-utility organ of great significance. Perhaps the mistaken belief that the elephant’s tusk is not of much use to the animal, has given rise to the Hindi idiom ‘हाथी के दांत दिखाने के और, खाने के और – Hathi ke dant dekhane ke aur khane ke aur’. Literally translated it means, ‘Elephant has two set of teeth – one to show off and the other to chew with’. Figuratively it means that what is obvious may not be the truth. I must narrate a story which brings out the full implication of this Hindi idiom. In January 2004, our Regiment located at Devlali, Maharashtra, was allotted a ‘Steam Jacketed Cooking System’ for the soldiers’ kitchen procured from special funds under the Army Commander’s Special Financial Power. 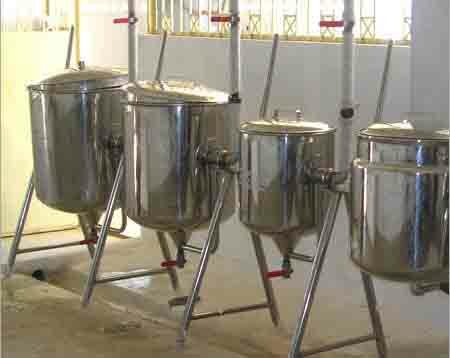 The Cooking System consists of four kettles used to prepare food items such as lentils, vegetables and meat. Each kettle has a capacity of about 60 litres. About the lower two-thirds of each kettle is surrounded by a jacket that is offset from the main kettle body to provide space for steam to circulate and heat the contents of the kettle. The kettles are permanently mounted on a pedestal and have a hinged lid or cover. They also have a tube at the bottom of the kettle with a faucet at the outer end for drawing liquids (used for cleaning the kettle) and a steam inlet connection, a steam outlet connection, and a safety valve. They also have a handle on the side facilitating tilting the kettle to pour contents into a service container. Kettles are made of corrosion-resistant steel. At one end is the Steam Generator which generates steam for the system by heating water using normal cooking gas. There are steel pipes that carry steam from the steam generator to the kettles. Great! I visited five regimental kitchens in the station who already had the system installed. Everywhere the system appeared hardly ever used. On inquiry the chefs revealed that the system was used for cooking only when there was any visit or inspection by a senior officer. Their reason was that it consumed too much cooking gas, much more than the authorised quantity they could draw from the Supply Depot. The Steam Cooking System was branded a ‘Gas Guzzler.’ Obviously it was only an elephant’s teeth to show off, with little or no utility. Better Food Quality in Better Hygienic Conditions. Standard cook pots used in military kitchens over an open burner heat its contents from the bottom where as this heats from all sides, providing a gentle, uniform heat that allows you to cook with minimal labour. It also reduces the risk of burning or overcooking your product. Better Productivity. This system cooks faster as two thirds of the cooking surface comes into contact with the food being cooked at a much lower temperature, compared to cook pots that use a much higher temperature only at the bottom of the pot. Less Labour. As the system does not require constant monitoring, stirring, it will save on labour. The kettles of the system are extremely quick and easy to clean. Safety. A standard 40 Litre cook pot partially filled will weigh more than 30 kg, creating a significant risk to the chefs when moving them manually. Transferring product inside a stock pot of any size can be potentially very dangerous, whereas tilting the kettles of the new system allow for safe, hassle free extraction of its contents. Energy Efficient. This system uses on average 35% less energy than cook pots on an open burner whilst also keeping kitchens cooler. I tried explaining to the chefs about conserving gas using the principle of latent heat of steam, that is water as it boils at 100° C absorbs heat without changing its temperature. The heat absorbed is called latent heat. Hence, by turning down the gas supply to the steam generator after the water has commenced to boil, one can conserve gas. All my scientific explanation was a little too much for the chefs to digest. They still held on to their belief that it was a gas guzzler and hence could not be employed for regular cooking. I now called up the manufacturer to inquire as to whether they had an Electric Steam Generator, which they confirmed, but it costs about Rs 15,000 and so I decided to foot the bill from regimental funds and accordingly and placed an order for the item. Prior to installation of the steam cooking system, the kitchen had to be modified and work was initiated with the Military Engineering Service (MES). The Garrison Engineer, a young Major, was surprised to find a request for a three phase electric connection in the kitchen, much different from similar work he had executed in the station. He paid a visit to the Regiment to study the requirement projected and our Quartermaster took him around. He was generally impressed by various equipment the kitchen had – flour kneading machine, potato peeling machine, freezers, coolers, power washer, microwave ovens and so on. He was also shown our near paperless office functioning on an automated computer network where every soldier could update his records and also carryout day-to-day administration tasks. Probably he had an irresistible urge to chip in. By the time the Steam Cooking System was setup in the kitchen, the Garrison Engineer had laid the new power line with an caveat to his power house staff that this line should be connected to the same feeder that connects the General’s Residence and power on this line will never be switched off without his express permission. Thus the elephant now began to chew with the set of teeth that were meant only to show off. Wow! You have effectively explained the meaning of the popular Hindi proverb by introducing the reader to the various facets of the mighty elephant followed by the derivation of the proverb alluding to the tusks of the elephant being used purely for display whereas the rest of the teeth are used for eating…. The manner in which you applied yourself diligently to dispel preconceived notions in the minds of the Chefs of your Unit regarding the efficacy of the modern Steam Cooking System which was lying unused and maintained for display purposes only like the proverbial tusks, by learning about the technology involved and by using your initiative to make infrastructural modifications to ensure the unhindered functioning of the system provides a lesson to all of us who get bogged down due to our failure to apply ourselves. A very interesting anecdote narrated in your signature style!